A stitch in line can be mighty fine! And for truly joyous and utterly charming examples of stitching then look no further than the artwork of Harriet Riddell (aka InStitchYou). Delightfully combining portraiture with the sewing machine, Harriet creates unique pieces of art that lovingly capture the essence and soul of their subject. Normally found stitching her way around the world on a peddle-powered sewing machine, we have persuaded her to come to the studio to teach a few lucky students how to stitch this curious world onto canvas. This course is for the experimental, adventurous and brave! Seeing what’s in front of you and learning how to freestyle stitch without drawing on the fabric first. Creating proportioned faces and learning how to add some InStitchYou charm! More portraiture and/or stitched scenes. Continue to explore more techniques like stitching words, free motion embroidery and appliqué. Capture a scene of your choice in stitch. Learning a range of techniques to help you dance with your sewing machine! Anyone who knows how to work a sewing machine. This course is not suitable for students with every little or no sewing machine experience. We generally advise that students be 14 years old+ though exceptions can be made where appropriate. A pair of sharp embroidery scissors. Any of your own fabrics that you may want to incorporate into your creations – they may have sentimental value or be special to you! *If someone wants to come to the workshop, but doesn’t have their own sewing machine or they don’t think their sewing machine has a free motion embroidery option, please get in touch and we can try to find you a machine for the weekend. In addition to gathering appropriate images and inspiration, Harriet will set you some ‘homework’ to prepare for the weekend once you have booked on the course. It won’t be compulsory so don’t worry if you don’t get time to do it before the course – there will be lots of time to practise during the workshop. 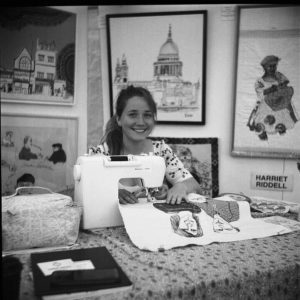 Harriet Riddell is a textile performance artist who travels around the world with her sewing machine stitching portraits and landscapes from life. Harriet’s love of interacting with people and going on adventures inspires her to create her artwork. Her stitched drawings appear from a single line of thread and using applique techniques she adds colour and words to a story. You can find out more about her on the InStitchYou website. I love to see other people fall in love with free-style stitching, it is infectious and totally addictive!